Seminal guitar god Joe Satriani is set to release his 14th studio album, Unstoppable Momentum, on May 7 through Epic Records. Noisecreep has heard it already - and it is truly epic. The folks at Epic have created a lot of interesting promo offers built around the release. 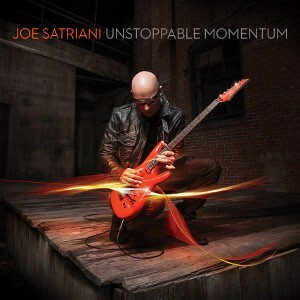 Fans can pre-order Unstoppable Momentum via this link and Satch's personal websore where they'll have the opportunity to bundle new signed copies of the album along with exclusive t-shirts and guitar straps. As well, at www.satriani.com, fans can obtain an exclusive new book featuring years of drawings, doodles and sketches that Satch has created. Noisecreep had the pleasure of speaking with Satriani about the amazing new record, his guitar heroes and an unforgettable concert or two. Joe, congrats on the new record. We love it. Thank you. Even at this stage of the game I do feel the pressure of wanting to hear what people think about the new music, and really hoping they like it. I'm not immune to that. I have an unexplainable urge to share every noise I make so yeah, what people think matters to me [laughs]. We go to those weir phases as artists where we will become like hermits as we create, but then when we're done we want the attention of the world. For me, it's just all about coming up with the best ways to maximize the melodic content in the songs. That's it. I just love crawling into a corner with a guitar and feeling like I'm in that vulnerable state. In today's day and age, where we are overly recorded and photographed and encouraged to tell our audience way too much, it's nice to get into a quiet space, off the road, and just create. A record like this comes from taking a break from travel, being home and being in my private space. Talk about the music of your youth - what did you listen to growing up? I wasn't yet a guitar player, but my older sisters and their boyfriends would always bring over the most current records of the day, to try and impress me, the little kid. Hendrix, Stones, Beatles - all the classics. I was kind of vicariously living through the '60s. Good thing was, I wound up accumulating this vast record collection in the form of hand-me-downs. As everyone got older they would give me their old records! And all those records became the foundation of my musical life. But after I became a guitar player, the next Sabbath or Zeppelin records became so important. And I had a broad palette. I loved swinging between rock 'n roll and blues and bebop and jazz and everything else. My mother turned me on to the great jazz guitarist Wes Montgomery and he became as big an influence on me as Hendrix. I was also seriously into Todd Rundgren. I mean, seriously. A truly underrated guitar player. Are you still a big fan? Oh yeah. I walked past him once when I was recording Not of this Earth - he was recording down the hall from us. I remember him walking out and I was just starstruck and I didn't even have the nerve to tell him what a great fan I am. I am a true dyed in the wool Todd Rundgren freak! Besides Todd, can you share an early, memorable concert experience with us? I remember going to see Led Zeppelin at Madison Square Garden and the stage actually collapsed. This is about 1973. They stopped the show and put the lights on. After about 20 minutes the band came back and did one more song and it was a great moment. And afterwards, some friends and I were went on the stage and we had to get piece of history. It was just some plywood stage so I was up there, trying to pull up this piece of wood, and this cop behind me actually used in nightstick to help me pry off a piece. You believe that? Man, I wish I still had that piece of the Zeppelin stage - I wish I still had that piece of history. Unstoppable Momentum will be released May 7 and various pre-order options are available here.